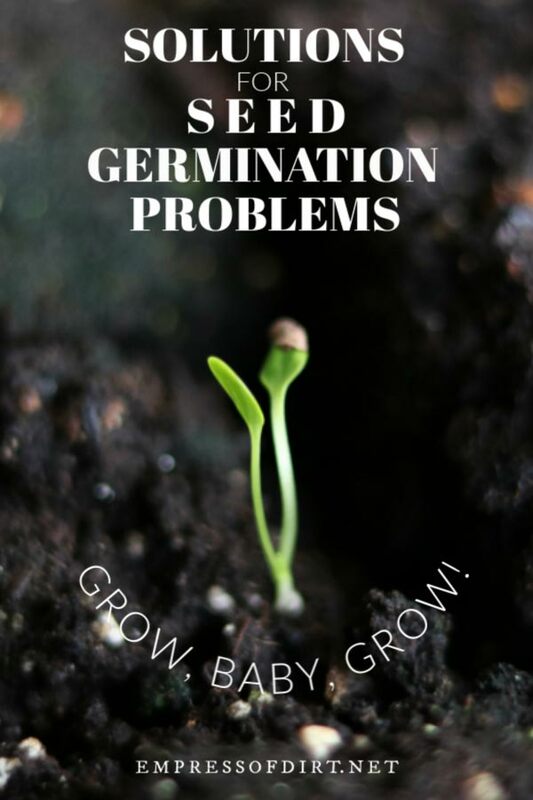 If you started seeds indoors and they are not germinating, or they have sprouted but they are failing to thrive, this should help you troubleshoot the problem. It makes me crazy when people say they do not have a green thumb and cannot grow anything, as if there is some sort of supernatural curse on them, causing even the best efforts to fail. Every garden mishap has a cause. With a bit of thought and patience it is often possible to figure out where things went south. And, no, it’s not a curse. It’s just that something essential to growth was neglected or overlooked. At what growth stage did the problem occur? Did you start with fresh, good quality seeds? If not, here’s info on how to find good quality seeds you can trust. The more recently seeds are harvested, the better they germinate. Some seed packets show sow-by dates. And, no matter how reliable the source, there are always a few duds in the lot (that’s nature). Get fresh seeds from a trusted source and always plant a few extras. Did you sow them as directed? Every type of seed has its own preferences. Read your seed packets for specific instructions. Some require presoaking, prechilling, or a scratch of their coats to encourage germination. Others can be directly sown. From there, it matters how deeply they are sown. Most are sown just twice as deep as the seed is wide. Others go on the surface because they need light for germination. Those seed packets provide a lot of valuable clues! This shows how to read seed packets and grow like a pro. 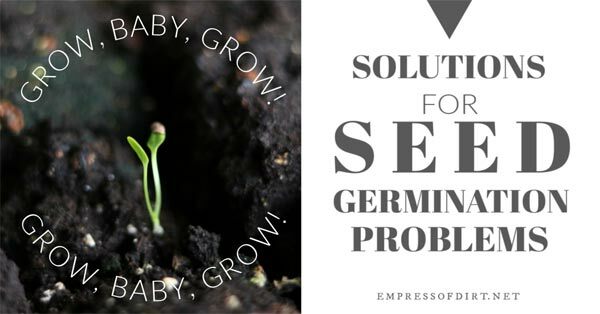 Did you keep the growing medium moist all through the germination and growing stages? When we store seeds, they are dormant. To sow them, we wake them up with warmth, moisture, and then air and light. If a newly sown seed is not in contact with the growing medium, it may dry out and die. Even moisture—not too wet or dry—is the key. Did you use growing medium intended for seed starting? We use special seed starting mixes for sowing seeds indoors because they provide just what the seeds like in these special indoor conditions. Seed starting mixes are lightweight and make it easy for the seed to receive moisture without having to fight to grow. Garden soils and other potting mixes can be too heavy for the wee seeds and introduce pathogens. Here’s a list of recommended supplies for sowing seeds indoors including the best growing medium to use. Was your growing space warm? 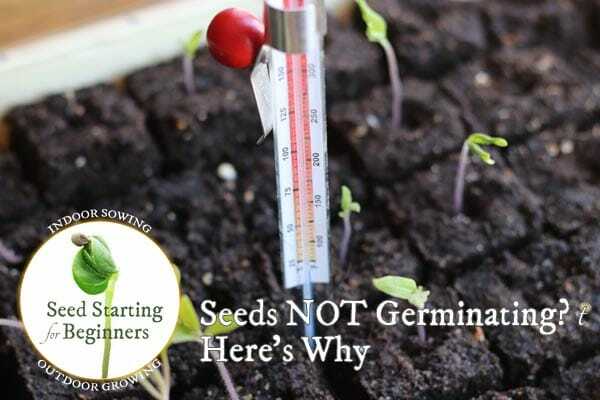 There are two different temperature groups for seed starting: seeds that like some warmth, and others that like more warmth. If your room (and growing medium) is too cold or warm, seeds may struggle, die, or never germinate. There is not an ideal temperature for all seed types but a good compromise that can accommodate them is between 65-75° F (18-23° C). If you have the space to accommodate the two temperature groups, this has specific details. Your seeds may have started off nicely but then, blah! Any changes in environment can bring everything to a halt. Extreme temperatures or lack of consistent moisture are the most likely causes. Again, temperature extremes or changes could be the cause. Some warmth is good, but too much heat and seedlings wither. Another cause is a group of pathogens called damping-off that like wet and cool conditions and kill or weaken seeds and seedlings. The name damping-off is strange, but the condition is fairly easy to recognize. Your seedlings will start looking like they were kicked in the knee and they gradually fall over and die. If you think this might be it, google it and check images. And when in doubt, remove the affected plants and growing medium. As far as I know, there is no remedy other than better growing conditions next time. This lists Best Tips to Ensure Indoor Seed Starting Success. This could simply be a matter of bad genes. Not all seeds from the same pack are created equal. There’s good ones and bad ones. Maybe you grew a dud. Another cause could be inadequate light. If a plant must work too hard to reach light, it will stretch and become thin or leggy, and appear weak. Nutrition is important too. The plant is surviving on whatever its environment provides. Perhaps your growing medium, or, at this stage, potting mix is deficient. If the plant is not too badly off, you could add some organic liquid fertilizer. Follow the directions on the container and consider diluting it if the plant is quite young/small. Overheating (which is essentially the plant drying out) is really tough on plants, especially the youngsters under grow lights or at hot, sunny window. Were your lights positioned just above the plants without over-heating them? Is the temperature in the room staying between 65-75° F (18-23° C)? Is the humidity between 30-50%? Many plants actually like a little more than this, but 50% is considered the maximum we should have in our homes, otherwise mold can form. Overcrowding also causes nutritional problems. With too many plants competing for the same resources in a tight space, someone or everyone may lose. Are your plants adequately spaced in their own containers? Timing matters too. You will notice on seed packets that, if a seed is recommended for indoor sowing, they will tell you how many weeks or days before your last frost they should be started. If started too early, the plant may get to a maturity level that your indoor growing conditions cannot sustain. It needs to be outside! Starting too late may not cause indoor growth problems but it can mean that there are not enough frost-free days outdoors for the plant to mature (fruit or flower). There can be a lot of different causes for this. Did you start with clean and sanitary growing medium, containers, trays, and tags? And nice, fresh seeds (no mold or mildew)? This shares how to clean and sanitize your seed starting supplies. Do you grow other plants that are also affected/infected? Do your houseplants already have problems? Or, perhaps you brought home a new plant and did not quarantine it first? There’s more on Keeping Houseplants Happy here. Do you use an electric fan for good air circulation? This can keep insects from getting to the plants. Did you water consistently and moderately? Dampness encourages mold, algae, fungi, and other troubles. 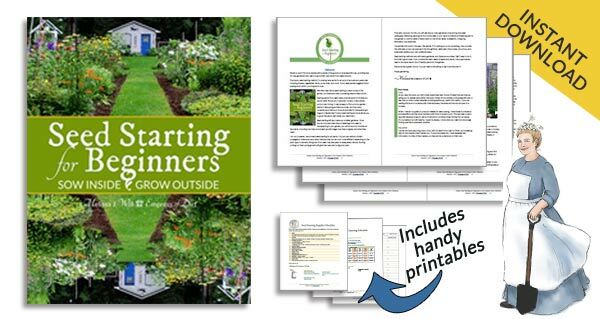 This has tips on keeping your seedlings happy and healthy throughout their growth stages. Okay, that’s quite a list! And again, it’s not a curse of a bad green thumb. There are just little things that become big things sometimes. The more you do this (seed sowing and plant growing), the more knowledgeable and mindful you will become. That’s another good reason to tend to your plants every day. Even if they don’t need anything, just becoming observant of how they look and grow at each stage is useful. Dig in again. You’ve got this.